RMS Aquitania liner launched in 1913, history and images. Aquitania was Cunard’s longest serving liner in the first half of the 20th Century. With her being designed to almost the same dimensions as the White Star Line’s Olympic class ships, Cunard had intended to claim Aquitania was the largest ship in the world when she entered service. The Hamburg Amerika Line stunned the British companies at that time when their liners Imperator and Vaterland entered service at over 50,000 tons. Although Aquitania missed out on holding the title of the world’s largest ship, her interiors were said to be the grandest of all the liners at that time. With the capacity to carry 597 1st, 614 2nd and 2,052 3rd class passengers, she set out on her maiden voyage from Liverpool - New York May 30th 1914. Aquitania only managed to complete three of these crossings before the British Admiralty requisitioned her to serve as an armed merchant cruiser during World War One. Aquitania had to be put into Liverpool for repairs after colliding with the liner Canadian on her second patrol. Skeptics that claimed these huge ships were unsuitable to serve as armed merchant cruisers were proved right by that incident. This led to the Admiralty converting her to a troopship for use in the Gallipoli Campaign. Within a short time, Aquitania had to serve as a hospital ship as the number of wounded at Gallipoli began exceeding all expectations. She survived the war unscathed and took part in the repatriation of Canadian troops until November 1919. Aquitania was then put into Armstrong Whitworth & Co on the Tyne to have her interiors restored and boilers converted from coal to oil burning. On July 17th 1920, she set out on the Southampton - Cherbourg and New York run. This gave Cunard three large liners on that route, Mauretania, Berengaria and Aquitania. The depression of the early 1930s forced Cunard to operate Aquitania more as a cruise ship. These cruises were normally out of New York - Mediterranean or Bermuda. 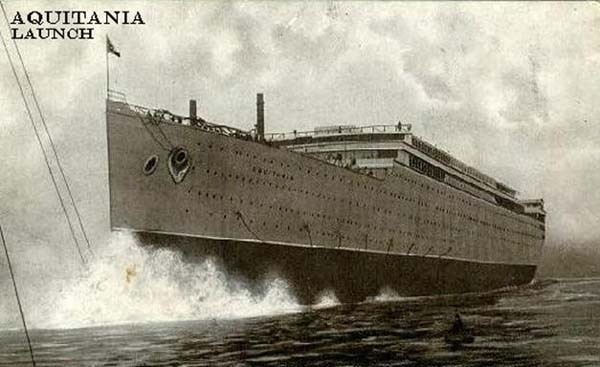 Aquitania was then operated between the Atlantic run and as a cruise ship until the outbreak of World War Two. On November 21st 1939, the British Admiralty once again requisitioned her to serve as a troopship. Over the following four years, she traveled throughout the world transporting Canadian, Australian, New Zealand and US troops. The end of that war in 1945 had again created the situation where servicemen from around the world had to be returned to their homelands. After Aquitania had completed the return of Canadian and US servicemen, she was used to transport European war brides and children of Canadian servicemen to Canada. Aquitania’s return to Cunard April 1st 1948 saw her chartered to the Canadian Government to carry emigrants from Southampton - Halifax/Canada. The end of that role in December 1949 led to Cunard selling their 35-year-old ship to the British Iron & Steel Company. Aquitania completed her final voyage to the scrap yard at Faslane/Scotland February 21st 1950.